Nasal polyps (NPs) are non-cancerous, inflammatory abnormal outgrowths on the lining of the nasal passage and paranasal sinuses. NPs are soft, painless, teardrop-shaped lesions and appear as a bunch of grapes. They come up around the area where the sinuses open into the nasal cavity. Studies report that prevalence of Nasal Polyps in general population is estimated to be around 4%. NPs primarily affect adults older than 20 years. They are rare in children under 10. Males are more likely to have NPs than females with 2: 1 male to female preponderance. The causes for NPs are unknown, but they are known to often associate with non-allergic rhinitis, asthma, infection, cystic fibrosis, and aspirin intolerance. Although they often occur for no apparent reason, people with allergic rhinitis and children with cystic fibrosis are more likely to develop nasal polyps than others. Sneezing, runny nose and postnasal drip are the symptoms experienced by majority of the people suffering with NPs. Further 75% of the people experience the reduced sense of smell. Sometimes NP symptoms are confused with cold/congestion but cold tends to clear up within few days whereas polyps won't get better unless treated. Asthma : Patients with late-onset of asthma (asthma coming on in adulthood) are more susceptible to developing NPs than childhood asthma. Chronic sinusitis: Patients with frequent sinus infections are at risk to develop NP. Rhinitis: Chronic inflammation of nose may lead to nasal polyps. Age: More prevalent in young and middle-aged adults. Genetics: People with a family history of the same are likely to be prone to NP. Cystic fibrosis: NPs are common in people with cystic fibrosis. Aspirin Sensitivity: People who have an allergic response to aspirin are more vulnerable to develop NPs. A general physical exam and an examination of your nose help your doctor to make a diagnosis based on your answers to questions about your symptoms. Polyps may be visible with the aid of a simple lighted instrument called an otoscope or nasoscope. Allergy tests : These tests help doctors to determine the source of persistent nasal inflammation. In these tests doctors test if your immune system reacts to any of the allergens. Test for cystic fibrosis : In children diagnosed with nasal polyps, doctors may suggest testing for cystic fibrosis, an inherited condition. The standard diagnostic test for cystic fibrosis is a non-invasive sweat test, which determines whether your child's perspiration is saltier than most people's sweat is. Nasal polyps are not painful and are not usually serious, but they can keep growing and block your nose if not treated. Medication or surgery can treat most of the NPs, despite the fact that they may come back if the irritation, allergy, or infection continues. The below are the two treatment options available. Nasal steroid sprays: In many cases, these corticosteroids helps in shrinking of polyp size or even get rid of nasal polyps. However, some people need to take corticosteroids orally for a week. Antihistamines: These help in alleviating the inflammation caused by allergies and reduce the runny nose symptoms. Antibiotics: NPs caused by a bacterial sinus infection are treated using antibiotics. For smaller polyps, polypectomy is performed. Polypectomy is an outpatient surgery performed using a small suction device or a microdebrider that cuts and remotes the soft tissue including the mucosa. For larger polyps, endoscopic sinus surgery is performed. This is done using a thin, flexible endoscope (nasal telescope) and tools at the end. Doctor guides the endoscope into your nostrils and removes the polyps. This is also an outpatient surgery. 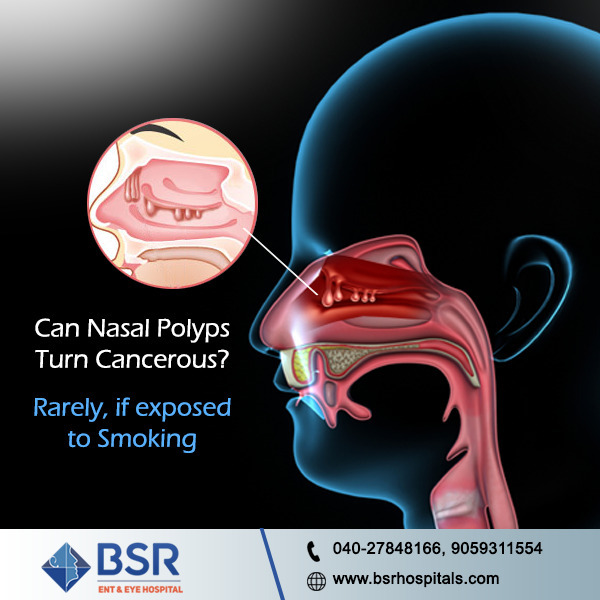 Why Choose BSR Hospital for Nasal Polyps? What makes the treatment most effective is the right doctor, who is qualified, experienced and trained to treat the condition, apart from the technologies and the tests done for accurate diagnosis. BSR ENT Hospital is one of the renowned ENT Specialist Hospitals in Secunderabad and Hyderabad with a team of expert and experienced surgeons who ensures the best quality treatment to patients. The 40+ years of experience explains our expertise in this world. Highly qualified, experienced and trained ENT specialists like Dr.B. Shanker Rao, MS, DLO, FICS and Dr.B. Kalyan Chakravarthy, MS ENT /Head and Neck Surgeon, are proficient at delivering best in treatment solutions for all ENT disorders. We at BSR, apply latest technologies like Zeiss Microscope, Lasers, Karl-Storz Nasal Endoscopic equipment with HD operating cameras and monitors that enable accuracy in performing surgeries. Our in-house Clinical and Biochemical Laboratory/Radiology help in quick diagnosis and treatment making it convenient for our patients. We take a patient-centric approach offering cost effective treatment solutions for our patients without compromising on the quality.